Due to this years FIAF congress taking place in Oslo the Norsk Film Institut decided to run their 70mm festival later in the year than usual (the preceding years it was mostly January or February). 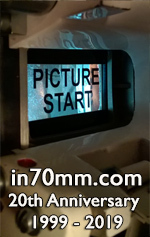 This was the first time I visited the Cinemateket 70mm festival and I have to say that the level of commitment to a very high technical standard was very impressive for me. I can say without taking away from other festivals I have attended that especially the pictures increased brightness that I will go into later in more detail really made a difference, a completely different experience compared to cinemas where not even the standard illumination of 16fL (open gate) is achieved. Here we had more than 30 fL and the colors where as bright and spectacular as ever - being able to light up a screen like this certainly cannot hurt ! As the 12 movies of the festival were spread out over a span of 13 days with repeated screenings I decided to strategically place my limited stay (5 days) in the timeframe that would allow for watching all the 70mm movies I could not catch before and therefore I stayed from Thursday the 6th of May to Monday the 10th of May which allowed me to watch all but one of the large format movies shown. This was a very nice print that I had never watched before and I was not disappointed as overall this is one of the most pleasing new prints that I have seen so far - simply spectacular with colors, resolution and both shadow detail and contrast being top notch. There were problems with scenes oscillating between yellowish and normal colors from time to time but I can only imagine how tedious (and unfeasible) it would be to correct that. A very sharp print that was interesting to watch as it started out a bit softer but then switched reels and focus in the scene with Patton and his dead driver/adjutant. I am pretty sure I saw that exact print before so I would like to make a remark of the projection as used in the Cinemateket. In Oslo, contrary to other festivals the screen is a bit smaller (a bit short of 11m wide for flat 70mm, the full 11.3 m for UP70 movies) but due to this even with a 3kw lamp and state of the art technology in both projector (DP70) and lenses (Isco Ultra) the picture is very bright and sharp. According to Stefan Scholz who is the technical advisor for Oslo the on screen illumination is in excess of 30ft-lamberts which is about 2 times the standard screen illumination! The effects of this were interesting to see with "Patton" that I also saw at last years Berlinale on an 18m wide screen and I would wager a guess that the screen brightness in Berlin was closer to a quarter of what we had in Oslo as back then "Patton" looked almost black and white to me with rather muted colors for most of the movie. With the screen illumination that was on display here saturated green and red popped off the screen and told a much different story. "The Bible - In the Beginning"
Another Dimension 70 film, not quite as sharp as "Patton" but still very good. The scenes in paradise were not as murky as before as a result of communication with Fox after the Karlsruhe festival and with extreme brightness afforded by the projection system even the many many very dark scenes in the second part of the movie worked much better than before - still a print that looks very dark to me but in part salvageable with more brightness. "Cinerama Adventure" - This is an extra on a Blu-Ray that I own so I did not attend, David Strohmaier was there though and I had the chance to talk to him later. He is really passionate about what he does and I hope he succeeds in getting the necessary funds to take on "Windjammer" as the next big project after "How the West Was Won". A flat looking, soft and scratched print that made for the worst presentation of the festival. While the scratches are nothing that Warner can do much about the print itself was so flat looking and soft that I hope Warner will one day revisit "2001 - A Space Odyssey" and see to it that this movie is available again in better quality. Attendance was very good though and it seemed to me almost like a full house except for a few seats. Back to better quality after the disappointment of "2001 - A Space Odyssey". This was a good if not very good print that I would have expected to look a bit better after having seen the extremely detailed "The Agony and the Ecstasy", especially the scenes on the island were extremely colorful and popped off the screen but details was not quite up to the level of the best. This was an HD master projected via a Sony 4k projector and with the limited budget available for this I think they did a good job. Still I hope that in the future we will see an effort to recapture most of the detail and splendor that Cinemiracle is capable of. Attendance was the best of the festival (not surprisingly as this was almost a Norwegian story) and it showed again that in the end it is the film itself that draws the crowds. A nice old fashioned comedy that did again look a bit on the softer side and also had a slight yellowish/greenish tint and it was the only production that i watched that had this problem. Very good to have it, though and another addition to the impressive lineup of new 70mm prints that we have gotten from Fox. Shown was a vintage in house print form the Norvegian Film Insititute that was still in great shape but already pretty faded. Due to the extreme amount of light available it was decided to show it with a cyan filter and the result was a picture that was still plenty bright and that only occasionally turned to red - this was a perfect situation for using this kind of filtering and the slight bluish tint that now was visible in some scenes was much less annoying than the "official" 70mm tint of pinkish-red. As this was the only Blow-Up print and also shown in between two 70mm screenings I paid special attention to the detail and overall look of the print and I have to say that it really stuck out among the other movies that were shot large format. I was one of the better Blow-Ups I have seen but still it was astonishing how much it was lacking compared to the movies that were not only presented but also shot in large format. This is the third time I watched "Lawrence of Arabia" in 70mm and it was also the third print I saw. All of them looked different and it was this one that was in the best mechanical shape and also the focus was really impressive. I have to say it seemed to be a bit too dark compared to what I had seen before and faces turned to a shade of olive more often than I would have liked - still a good looking print that had the best attendance of the regular 70mm screenings I attended. As this print came to the cinema courtesy of a special gentleman my thanks go out to him for allowing this print to be screened as it looked significantly better than another print I saw a few years ago that had much bigger problems than just being too dark. I would like to close with a special thanks to Jan Eberholst Olsen and all the other people who did a great job with this festival despite the fact that they also had to accommodate the FIAF people. A very special thanks goes out to the beautiful ladies who offered us candies before the start of the movie, just like it was 20 or 30 years ago - that was a nice touch!